Discover cheap holiday packages to Hawaii from Auckland, Wellington, Christchurch and Queenstown. Explore the five main islands and immerse yourself in the unique Polynesian culture and incredible natural scenery. Take the stress out of planning your trip and save big with a flight and hotel package deal. Search a huge range of holiday packages at Webjet and find the best combo package deal for your trip to Hawaii from New Zealand. 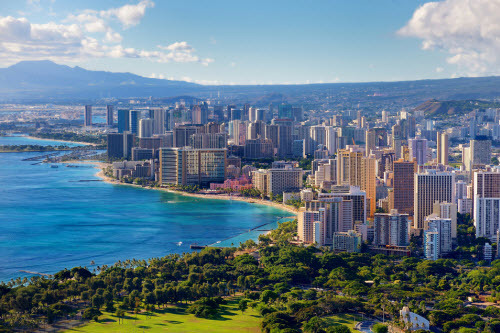 From its affordability to an endless array of hotels and activities, there are many reasons why Hawaii is a top destination for New Zealanders. With direct flights from Auckland taking only eight hours and affordable holiday packages, it's easy to find a great deal and travel halfway across the Pacific without breaking the bank. Hawaii is also the perfect destination for older Kiwis. If you're over 50, you can get discounts on just about anything: hotels, tours, activities, restaurants and so much more. The islands are home to over 300 hotels, meaning you'll find something to suit every budget. Families can opt for all-inclusive resorts or self-catering apartments, couples can book a boutique romantic getaway, and solo travellers can splurge or save at frugal hostels. For those looking to relax, Hawaii is the mecca. It boasts some of the world's best wellness retreats and spas so you can unwind with some well-deserved R&R. But the island nation's biggest drawcard is arguably its activities. From the incredible dive sites to its hair-raising hikes; from important historical monuments and a vibrant local culture, Hawaii has something to offer every kind of traveller. 1. Money: The US dollar is the main currency used in Hawaii. If you want to avoid additional charges, skip exchanging your money at the airport and instead withdraw cash from one of the many ATMs. 2. Electricity: Hawaii uses 120 volts and type A and B power sockets. Kiwis will need to bring a power plug adapter, and it's recommended to use a voltage converter too. 3. Entry Requirements: New Zealand is one of over 37 countries that is part of the Visa Waiver Programme for the United States. You'll be able to spend up to 90 days in the country. All you need to do is apply for your Electronic System for Travel Authorisation (ESTA) 72 hours before travelling. If your ESTA is denied, you will then need to apply for a B-1 Visitor Visa or B-2 Tourist Visa. 4. Language: English and Hawaiian are the two official languages in Hawaii. There is also a third unofficial one called Pidgin. It's widely spoken and combines slang words from many different aspects of the culture and way of life. 5. Weather: The best time to visit Hawaii is during its shoulder seasons. From September to November and March to June you'll find emptier beaches and lower prices. If you want to avoid the crowds, plan your trip around the first week of May. It's known as "Golden Week", and prices soar as tourists from Japan flood the islands. 6. Getting Around: Hawaiians drive on the right-hand side of the road and speed limits are in miles per hour. If you want to hire a car, you'll find the cheapest rates on Oahu and Maui. Booking ahead of time is essential, as during peak season the islands run out of vehicles. 7. Drinking Water: The tap water is safe to drink in the developed areas. If you're staying in more rural parts, check with your hosts beforehand to make sure it's safe. 8. Health: Due to the Kilauea Volcano, volcanic smog can cause respiratory problems. Check the air quality report if you're staying nearby and pack any necessary medications.